You have an idea for a product. You make the product. And now it’s time to sell the product. So what’s the one thing you’ll do to sell your product? Advertise it of course. This is pretty much the pattern that most product makers follow. In the game industry it’s no different. With catchy slogans, flashy graphics, and some off-the-wall shenanigans, an ad is supposed to convince you to buy the product they are selling. But ignoring all of the attempts to sell and actually looking at the ad, they always seem to be a product of the era that they were released in. So for this retrospective, we’re going to look at one of the longest living game companies, Nintendo, from when we played with power to two guys asking us if Wii would like to play. With the Videogame Crash behind them, Nintendo was poised to take over and dominate the revitalized game industry. Throughout this era, they used the slogan “Now You’re Playing With Power,” a sort of testament of how much more advanced their system was compared to what the previous generation, and their 8-bit counterpart, the SEGA Master System, had. They were a force to be reckoned with. 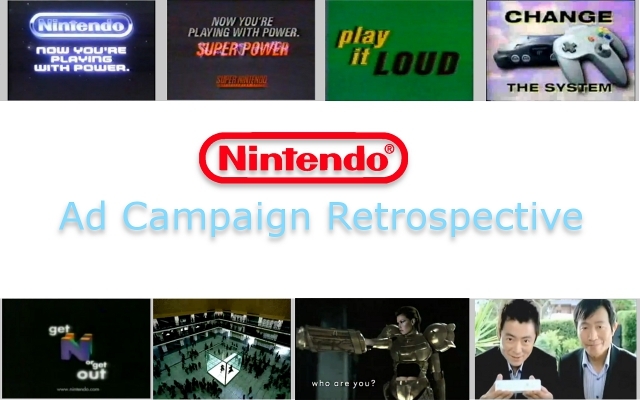 One thing of note here is that it was mostly Nintendo using this Playing With Power campaign. The third parties used their own campaign to sell their games. If you looked at the things Nintendo sold, they almost always had “Power” somewhere in the name, like the Power Glove. While the games themselves never used “Power” to indicate the system they were on, this was a precursor of things to come. Now let’s look at the commercials themselves. The music is very, very ’80s sounding. Of course, this is what you would expect from a product of the ’80s. Much of the special effects also smacked of ’80s as well, with glowing blue lightning bolts, very sparkly explosions, and a lot of bright lights. The clothing, interestingly, is relatively tame and not overtly loud like what you’d see in music videos at the time (or some sitcoms). This entry was posted in General Articles, Retro Games and tagged ad campaigns, change the system, commercials, gamecube, gamecube ad, get n or get out, Luigi's Mansion, metroid prime 2 echoes, n64, nes, nintendo, nintendo 64, now you're playing with power, play it loud, punch out, SNES, super nintendo, super power, super smash bros, who are you, wii, wii sports, wii would like to play, Yoshi's island on February 25, 2012 by Steven T..